Parallel Digital is a company specialised in BIM Management and the use of digital technology in the construction process. It makes it possible to meet the requirements of a construction industry that needs to innovate. With backgrounds in architecture, engineering and construction, we have often seen the development of our industry sector falling behind, with lags in technological innovation, project management, implementation methodology, the improvement of existing assets and the attention paid to the use of resources. We are convinced that the professions should reposition themselves at the heart of the construction process and initiate the necessary changes. For this to happen, we believe that developing BIM (Building Information Modelling) methodology is the first step to take. 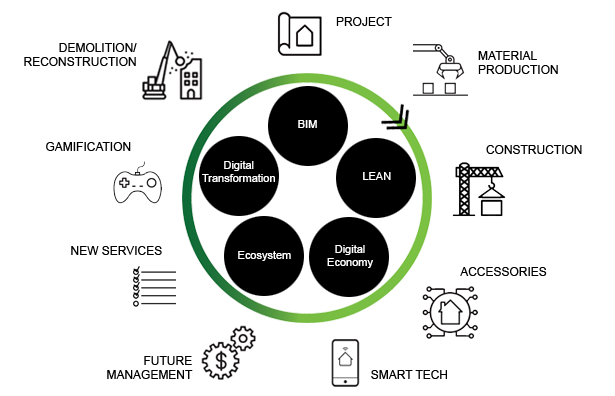 Thanks to BIM, Parallel Digital intends to innovate in the construction sector and trigger changes in the life cycle management of a building and infrastructures in general. The immediate consequence of these changes is the reassessment of the rationale that governs the relationships between the different disciplines and companies. The BIM methodology requires team work that results in new synergies, new partnerships and new professional profiles. Parallel Digital is the response that It's, an architectural firm, and INGENI, an engineering firm, have found in order to proceed with the changes that the construction world requires. Today, Parallel Digital successfully assists many clients, whether they are contracting authorities, building owners or entrepreneurs.